Hi all of you out there on Ninja Kiwi! Welcome to the blog post for August 18, 2017! This week we released version 3.10 for Bloons TD 5! This update brings Tower Skins starting with the Medieval Dart Monkey, along with a new track. Ready your blade and prepare for battle on our brand new map: Siege! The bloons are storming the caste on this tricky advanced map and it's up to the Monkeys of the Round Table to stop them! Can you halt the bloon invasion and save the realm? Tower Keepers: 2x Rewards in Hero Battles. Double Gem Sale and Thief Skin on Sale! BTD Battles: BFB on Friday, MOAB and MOAB Random Clubs on Saturday, BFB with no random tower and BFB Club on Sunday. Bag and Chest of Medallions and Steampunk Sub skin on sale. SAS4 Mobile: VS on Friday, Apoc on Saturday and LMS on Sunday with Black Box as reward. Epic Pack, Nantoniums and Torment, Proton Arc and Zerfallen on sale. BMC Web and Mobile: Daily Monkey Teams with Knowledge Packs as reward on Sunday. Monkey Knowledge Packs on Sale. BTD5: Fresh Golden Bloon and Invasion Events. BFB pops counting for the leader boards. BSM2: All items on sale! This week's competition is to combine a Ninja Kiwi game with a non-Ninja Kiwi game and show it in one picture. 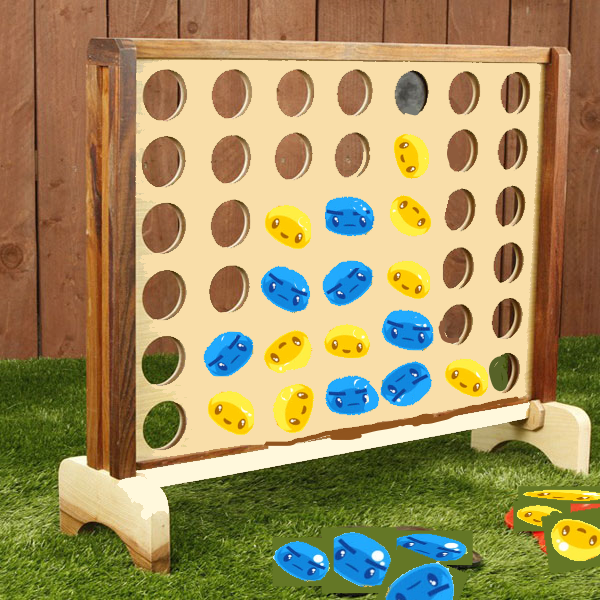 For example, this Connect Four Meeblings game I prepared just now in Paint. I recommend using Gimp or Photoshop if you can. Once you've got your idea and put it together, upload the image to an image hosting site and post it in a comment below with your entry details. The prize for this competition will be 100 NK coins and a mystery prize for a game of your choice! Will BTD5 web's maps ever be put on the Steam (mobile) version? Will the SAS4 Championship of 1-4 September be Virus Samples only or half apocalypse? Outlook hazy, try again later (not set up yet). What's your favourite soundtrack in any NK game? Can you add Space Resort as a map for Apocalypse? Could we get some shorter (2-3 days) Championships? How does Bonus Health work in Tower Keepers? It's essentially a shield, taken off first before "real" health is lost. That's all there is this week. Good luck with your competition entries and have a great time being awesome!